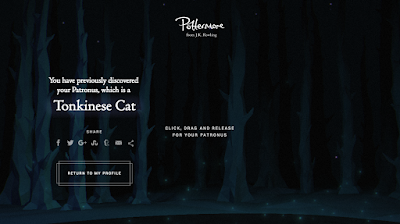 Nerdy By Nature: What's Your Patronus? So not only is today the first day of fall and my Mom's birthday, but today is also the day I found out my Patronus! Now, you should all know my love of Harry Potter by now (I mention it at every opportunity) and I'm a sucker for all those Pottermore quizzes, so I couldn't wait to get home and take this one. I was slightly intimidated by this quiz because it was timed and you're being whisked around the forrest by a will-o'-the whisp looking thing, and they aren't so much as questions but rather you picking a word that you'd associated with yourself. Am I more stone, wood or earth? I don't know and the building music in the background isn't helping my only seconds long decision! Oh, the pressure! Now, to be honest, I don't even know what a Tonkinese cat is, but according to Google it's a cross between a Siamese and a Burmese cat. I'm also not the biggest cat person being that I'm allergic to them, but this does sort of make sense to me. Tonkinese cats are loyal, playful, intelligent and curious. They are content in social situations, but also like to be on their own. They're easy to care for and are generous with the affection they give to their loved ones. In a weird way, it does sum me up pretty well. Has anyone else tried the quiz? If so, what were your results? 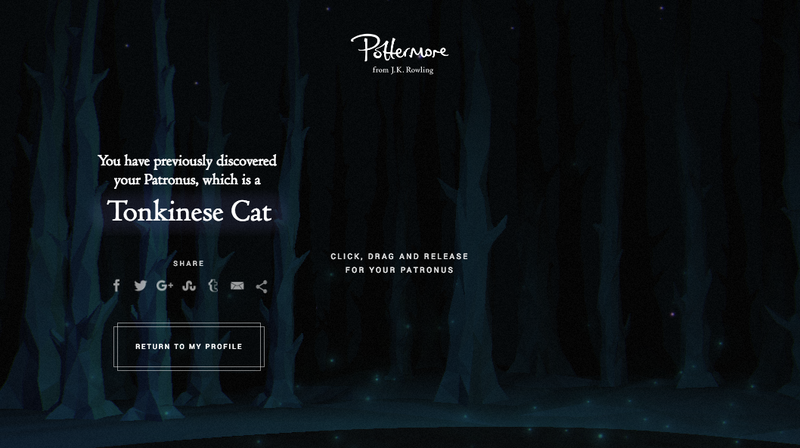 And if you haven't, head over to Pottermore and find out!